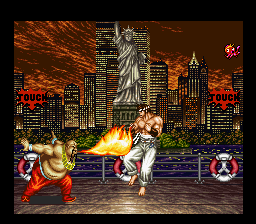 I grew up loving fighting games. 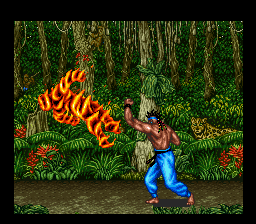 Being born in 1983, I was around 8-11 right when it was the “Golden Age of Fighting Games” (circa 1991-1994). 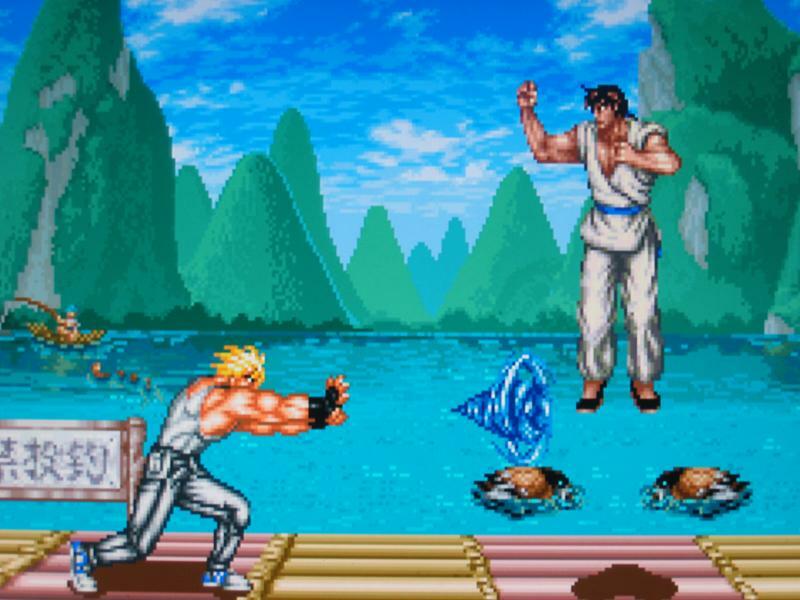 I ate up the Street Fighter II clones that popped up overnight like a bad pimple on prom night. 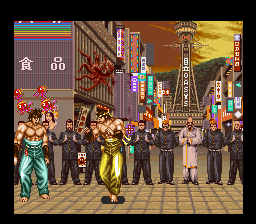 One of my favorites was Data East’s Fighter’s History (1993). The first time I saw its colorful, comic-book like cabinet, it was instant love. The game has a mixed bag reputation (leaning more toward “below par”) but I’ve always liked it. It’s a true story that was featured in Rob Strangman’s 2014 book “Memoirs of a Virtual Caveman” (which can be found on Amazon.com, cheap plug). On one epic June morning, my old best friend Nelson and I came across three imports in the flesh that were months away from their US release. It was, in a word, glorious. 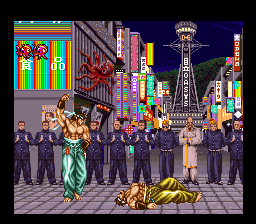 I have fond memories of playing Super Famicom Fighter’s History that hot summer day at Nelson’s. We would switch off and it was an awesome time to be a carefree kid growing up in suburbia. Conjures such nostalgic memories for me! Takes me right back to Nelson’s living room on a hot June afternoon of 1994. Such amazing memories. 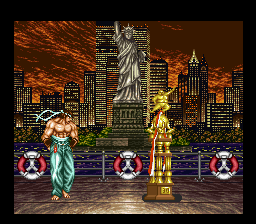 On a side note, the SNES Fighter’s History port doesn’t get enough credit. 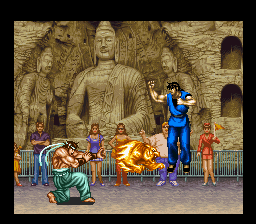 It’s one of the best arcade-to-SNES translations I have played. Really well done by Data East. 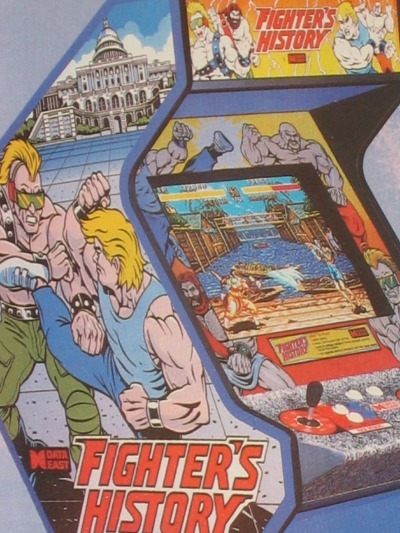 Fighter’s History Dynamite came out in arcades in 1994. 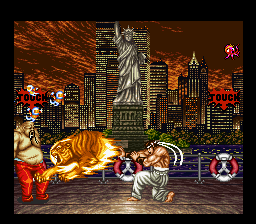 It is also known as Karnov’s Revenge. 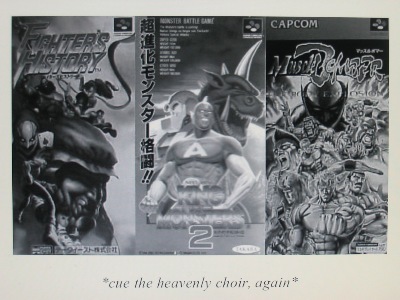 But did you know there was a THIRD Fighter’s History game? 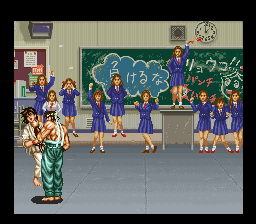 And believe it or not, of all systems it was released ONLY on the Super Famicom February of 1995. Its full name is Fighter’s History: Mizoguchi Kiki Ippatsu!! Stripped down to 8, it seems like a massive step back. Especially considering the 1993 original had 9 characters to begin with, and the 1994 sequel had 13 characters. To go down to 8 in 1995 seems like a waste. Therefore, it feels like a weird remix of the first two games. 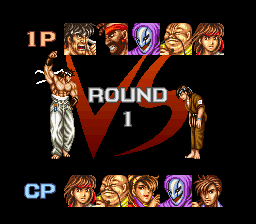 Had it included all the characters, this would easily have been the definitive Fighter’s History game. 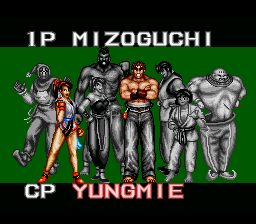 The game opens with a nice intro, at least. 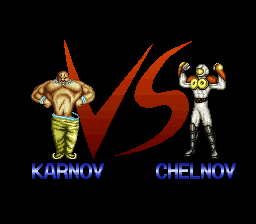 We’re (re)introduced to Data East’s Chelnov character, who appeared in Atomic Runner. 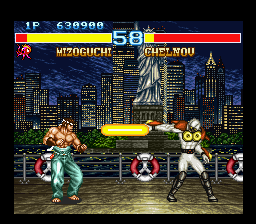 We’re also treated to the titular star’s special moves. 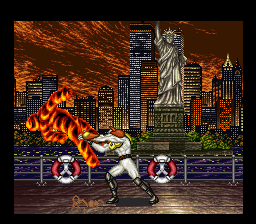 The game introduces mostly new backgrounds. Sadly, they’re not as memorable as the ones found in the first game. 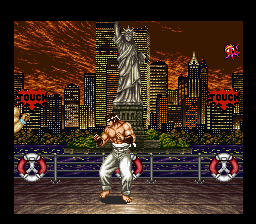 I always enjoyed the first game’s backgrounds. They weren’t flashy, but had a quiet solid quality backing them. 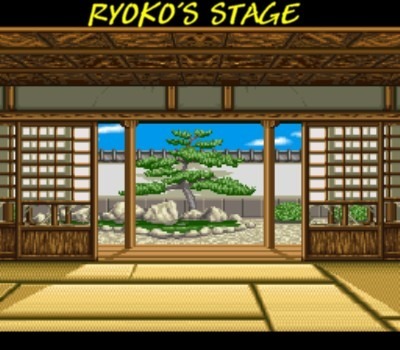 By comparison here is Ryoko’s original stage below. 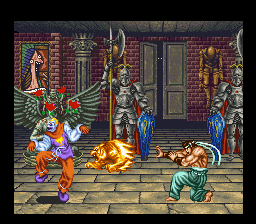 I loved Clown from the first game. There was a sinister element to him from the first game that is missing in this game. I can’t quite put my finger on it, but he doesn’t feel the same. Almost like it’s an imposter of the first Clown. Huh. Maybe it’s just me being weird. Good bet. 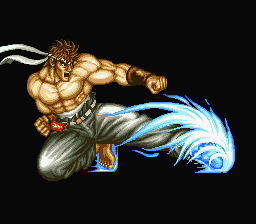 Zazie is one of two new fighters from Fighter’s History Dynamite. I never liked him much. And Yungmie is the other one. Never liked her either. It’s a shame these two characters made the cut and that Ray, Matlok, Samchay, Jean and Marstorius were left on the cutting room floor. 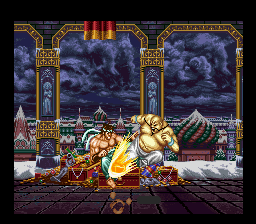 Karnov’s stage from Fighter’s History Dynamite is recycled. Not bad. I’ve always liked this background. 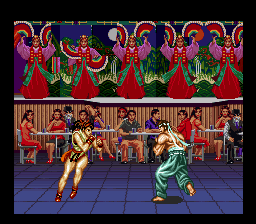 A rare instance in which I prefer the sequel’s background to the original version. 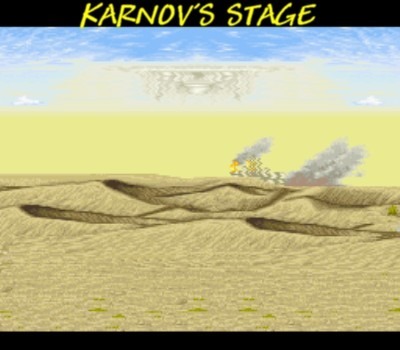 Here’s Karnov’s bare bones boring stage from the original game below. 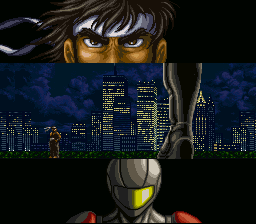 Press Down, Down, Up, Up, Right, Left, L, R at the title screen after the opening intro. It’s a battle of the ‘Novs! 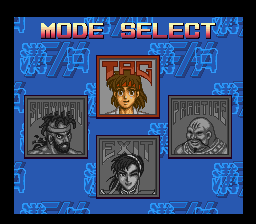 The game’s most interesting feature is undoubtedly its FOUR player tag mode. Yes, up to four human players can plug up and play. 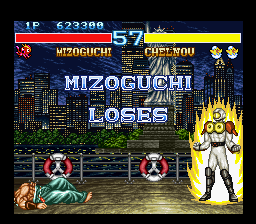 Not at once, mind you, but it’s pretty impressive for an early 1995 fighting game. 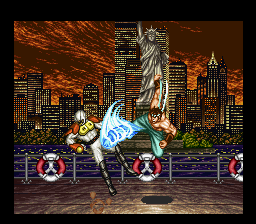 Early shades of X-Men vs. Street Fighter and the like! 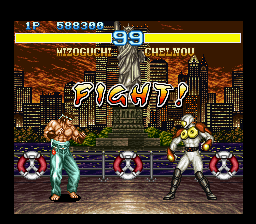 As far as I know, it’s the only “4 player” fighting game on the SNES. For that alone, it’s gotta be considered at the very least, “noteworthy.” Also throw in the fact that this is the only “sequel” to an arcade game that came out exclusively on the SNES. Data East breaking all sorts of ground with this game. See the touch sign there? Simply hit select at those points to switch out to your tag partner. 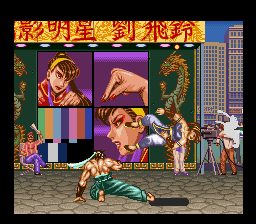 There is a slight half second delay but all things considered it’s not bad, especially for 1995 16-bit standards. Quite frankly, it was pretty innovative stuff. Two different practice modes are also available. 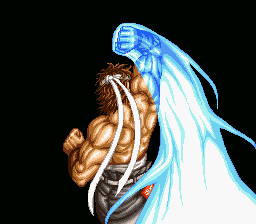 In addition, a survival mode rounds out the extra bonuses. Nice job, Data East. Still, these cool modes don’t quite make up the difference for gutting your roster. 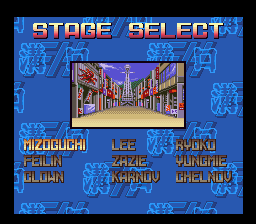 There’s no doubt the SNES could have handled those 5 fighters. Weird, and lazy! I have mixed feelings about this game. The sound is pretty dang awful, but it’s nice to hear that wacky announcer return. 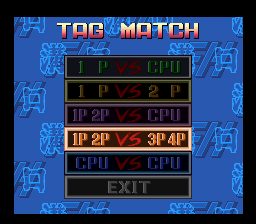 The tag mode is an awesome feature, but on the flip side cutting those 5 characters really drag it down. 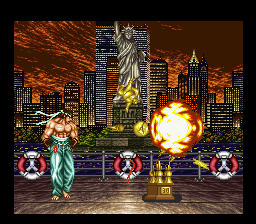 Also, being a big fan of SNES Fighter’s History, this game doesn’t quite possess the same physics as that game. I can’t quite describe it but play it and you’ll notice the difference(s). I much prefer the gameplay and physics of the original.